Pascal: Balloon, you must obey me and be good! The Red Balloon (1956) is a classic children’s story. And at only 34 minutes, it’s one that children can sit through. The thing that makes this film so good is its simplicity. The storyline is simple, the characters are simple, and the dialogue is simple (though largely non-existent). 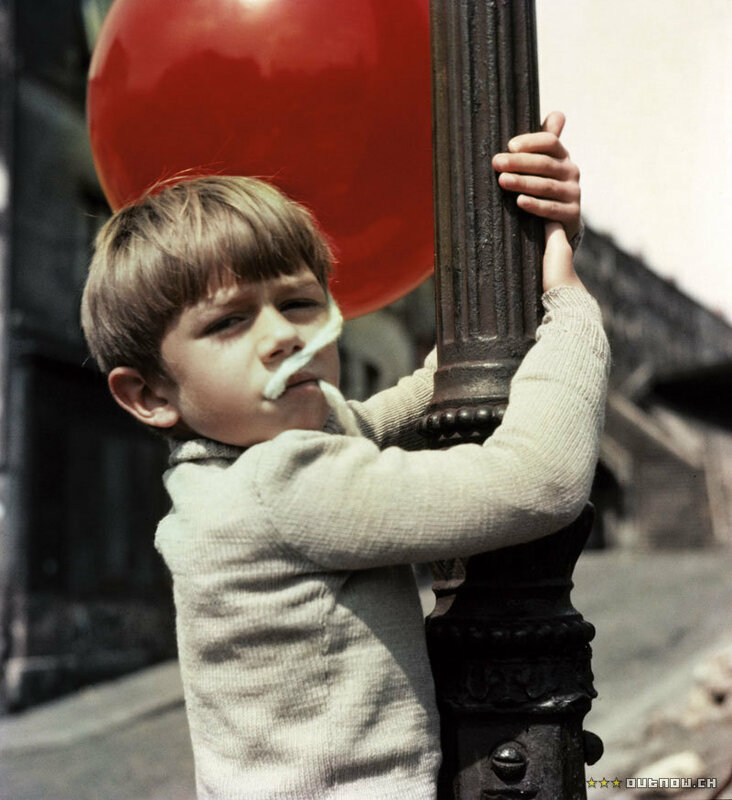 The Red Balloon begins with a young boy named Pascal (Pascal Lamorisse) roaming through the streets of France. Well actually, while that is the first scene, the film really begins with the credits. As the names pass over the screen, you hear the floating music that sets the tone for the picture. 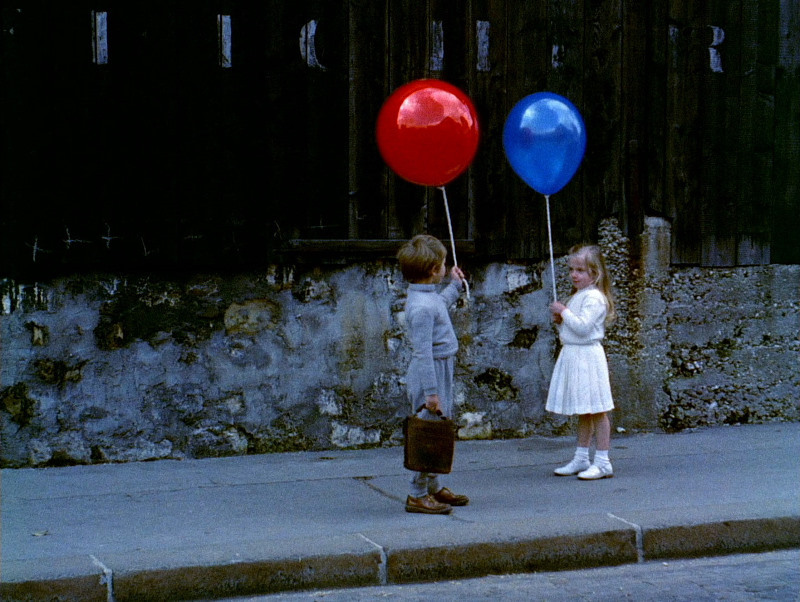 In fact, it is this very music that makes The Red Balloon a beautiful film. Because there is almost no dialogue, it is left to the music and the characters’ movements to tell the story. The director, Albert Lamorisse (Pascal’s real life father), uses these devices wonderfully. Now, back to the story. As Pascal wanders, he finds a red balloon (inspiration for the title perhaps?) hanging on a lamppost. Pascal climbs up, frees the balloon, and the two start a rather unique friendship. The balloon has a mind of its own. Fortunately for Pascal, the balloon focuses on listening to him and following him around. Onlookers are fascinated by the obedience the balloon exhibits with him, and rightly so. While Pascal may wish he could spend all day with the balloon, his obligation to school places him in a most vulnerable position. In an act of great risk, Pascal entrusts his balloon to a man sweeping the street. He asks the man, “Could you hold my balloon for me while I’m in school? Don’t let it go!” The man takes the balloon and Pascal runs ahead to school with the hope of reuniting with the balloon later. The Red Balloon is in many ways an allegory for life and love and the lengths we will go to protect them. The relationship between Pascal and the balloon is constantly tried as the other children quickly become jealous and intent on destroying the balloon. So much commotion is caused by Pascal having it that the schoolmaster locks him in a room and takes it away (and the balloon then proceeds to taunt the man). In one particularly beautiful scene, Pascal comes across a young girl (Sabine Lamorisse, Albert’s daughter) who is carrying… you guessed it, a balloon (a blue one to be exact). 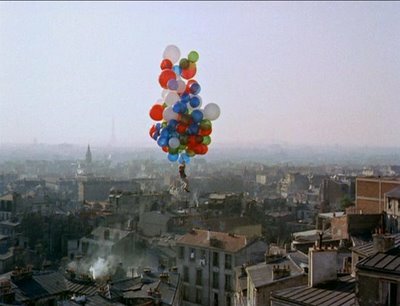 As they pass the girl, Pascal’s balloon (quite predictably) goes straight to the blue balloon in what I’m convinced is the only balloon love sequence in film history. The two balloons share a few exchanges of affection and Pascal and the girl have their own loving interaction. The story seems so perfect, with the small setbacks understandably sprinkled in but conquered, until the other children are able to take the balloon from Pascal. They proceed to throw rocks and other objects at it as Pascal looks on hopelessly. Finally they are able to hit it and the air slowly fizzles out as it falls to the ground. The children run away and Pascal is left with his friend’s lifeless body (some heavy symbolism for a children’s story, isn’t it?). In that moment, all of the balloons in the entire town float up and come to Pascal. As he grabs hold of them and the smile returns to his face, he is lifted up (literally). Pascal is taken up above the town by his new multi-colored friends as he floats away. Sorry I told you what happens in the end of the film, but for something as short and sweet as this, it’s almost like listening to Little Red Riding Hood (we all know how it ends). The Red Balloon is a timeless tale that has been and will forever be enjoyed by children and adults alike. If you can get your hands on a copy, give it a view. Actually, watch it a couple times, it really is something special. After all, in life we’ve all had our red balloons. A very adorable story, but do you really think it deserves a 9? Simplicity, which this film has a lot of, can be a good thing in several cases (12 Angry Men…basically a movie set in one room for a good two hours), but I feel this film lacks the ingenuity of a real Classic. True, it poses an interesting metaphor, but I don’t agree that this film deserves a 9. Perhaps it is because you gave the Red Shoes a 8 ;-). 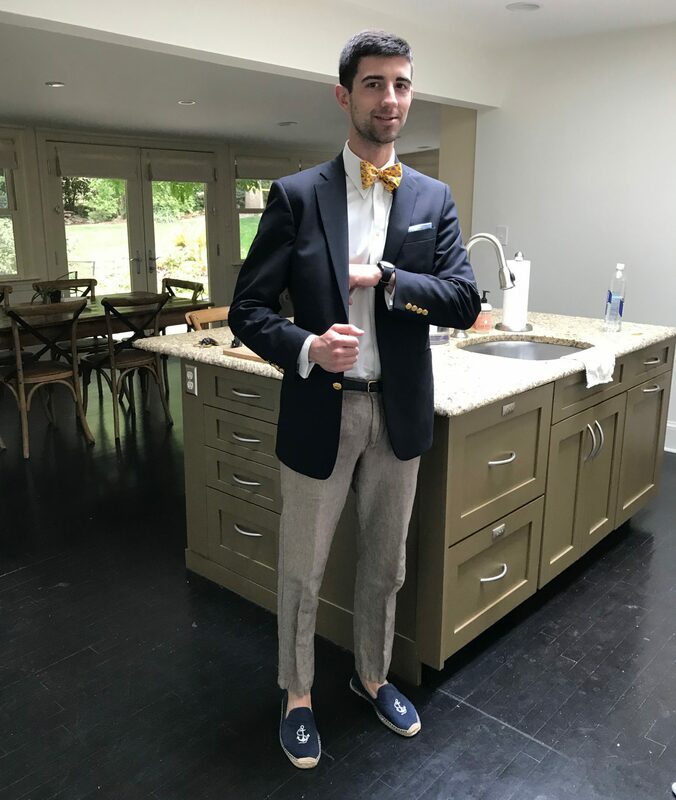 I would like to take this opportunity to try and clarify a couple things. I’m glad that this was brought this to my attention because I think it’s very important. The Reel Rating system is one of specificity. What do I mean by that? Take for example The Red Shoes and The Red Balloon (excuse the repetitive color theme). I gave Shoes an 8 and Balloon a 9. Do I think that Balloon is better than Shoes? Not necessarily. This is not a ranking system (I’m not sure I could even begin to put one of those together). It really just depends! I also want to encourage others to both agree and disagree with me; that’s the best way for me to improve The Written Reel. 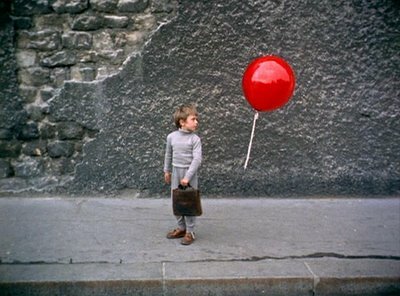 With regards to The Red Balloon, I think that there is a certain ingenuity to be recognized in simplicity. The film does an excellent job of taking ordinary things and making them seem extraordinary. All to often films are made that try too hard and do too much, but The Red Balloon does neither of these things. Sometimes the best films are the ones we can relate to the most. As I said in the review, I think we’ve all had our own red balloons. It is a timeless tale and in my mind, a true classic. Also keep in mind, these are merely my opinions, and I am by no means THE authority. It is fair to agree or disagree!